Edward Parry, Director RFFR, suggested that I might carry out a formal review of the work in Romania - in particular of Fundatia de Sprijin Comunitar, the Romanian charity we had set up to take over many of our projects. Edward kindly recommended that I be accompanied by Elizabeth Winstanley. Julia Smyth background: Medical Ward Sister, St Bartholomew’s Hospital; General Practice Nurse/Manager; Community Nurse in Elderly and Palliative Care; Project Co-ordinator RFFR Mobile Health Care unit 1992 - 1994; RFFR Projects Manager 1994 - 2006. Elizabeth Winstanley background; Civil Service; various PA and admin posts; RFFR Admin Manager 1995 to the present day. Fundatia de Sprijin Comunitar is a “Gold Standard” organization operating to the highest standards in all aspects of its service delivery, management, staff performance and in engaging with all stakeholders, local and national authorities and commercial partners. The calibre of the staff is simply outstanding. They are well-trained, disciplined, very focused, dedicated and extremely hard-working. Everyone I met puts in a lot of extra, unpaid hours and could not have been more helpful. The atmosphere at their extensive offices in the Mosaic Centre is inspirational with an impressive work ethic throughout all their operations. Though this risks sounding over-effusive it is borne out by the many national and European prizes they have won (see Appendix i. list of awards). Furthermore this dedication and commitment has spread to state employees that I met who work alongside FSC staff, such as the rural Mayors’ Social Workers, staff at the Child Protection Services and even the Mayors themselves. This new dynamic among state employees is a vast improvement on my experiences in the 1990’s. I did not encounter any of the “Ce se fac?” (“What can be done?”) fatalism with which I was so familiar. Are nationally accredited trainers in Combined Arts Therapy, Care of the Elderly, and Social Work ( a six month course). 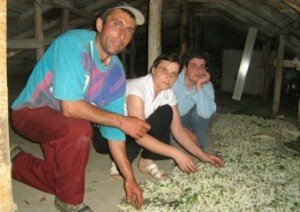 Their training, many national conferences and publications have spread skills and information throughout the North East and indeed the whole of Romania. 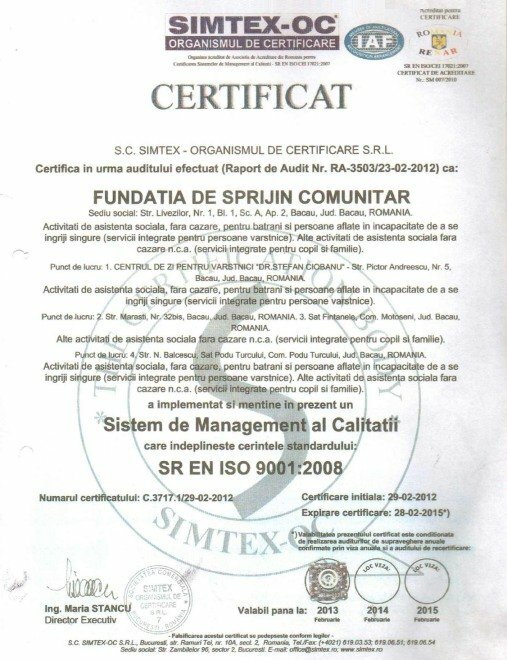 Impart training has been carried out in over 50% of Romanian institutions. Their total budget 1997 - 2012 was £8,133.893 of which 21.6% was provided by RFFR. But the RFFR funding has been the only consistent and reliable core funding as they move from different funding opportunities and it has enabled them to keep going as grants ebb and flow. Overall they have provided care and training to many thousands of the most needy in Romania. This compares to DFID expenditure in Romania 1997 - 2003 of £28.4 million and it is very hard to discover what this huge amount was spent on (see https://www.oecd.org/countries/romania/36499336.pdf OECD evaluation of DFID spending in Romania.). They are an influential example of good practice and an effective lobbying agent together with various NGO forums which they have helped to set up. FSC, the organization and its staff have remained flexible and reacted well to change. Their staff switch between projects as the need arises. Lenuta Nastac for example, as well as leading the IMPART training and teamwork, took over at Casa Pistruiatil when they had staffing problems and now runs the Milly Centre. FSC have been extremely effective in devising their own new programmes, e.g. the very successful Volunteers and Summer Camps projects and the wonderful Glue Clubs. They have also shown real imagination and skill in the development and evolution of old projects such as Tumble Tots/Play Therapy and the original Mobile Health Centre which have both evolved into complex community based health and social services and training programmes. FSC, their associates and British trainers have been a real agent for change, particularly regarding the treatment of and attitudes towards the disabled and in the delivery of health and social care to the most needy. They have been pioneers in creating models of health and social care and in successfully selling them to the state and in engaging with other stakeholders, local and national businesses and encouraging and networking with other NGO’s in Romania. They face many constraints, mostly with funding insecurities. Both the central government (Law 34) and the Bacau mayor constantly keep them waiting for news of funding or in forwarding funds late. In the project work, most constraints appear to be in the elderly home care programmes. The carers often report not having enough time with their patients, of having to walk long distances and being short of resources. I visited many patients who needed more time from the carers but which the project just did not have the capacity to deliver. 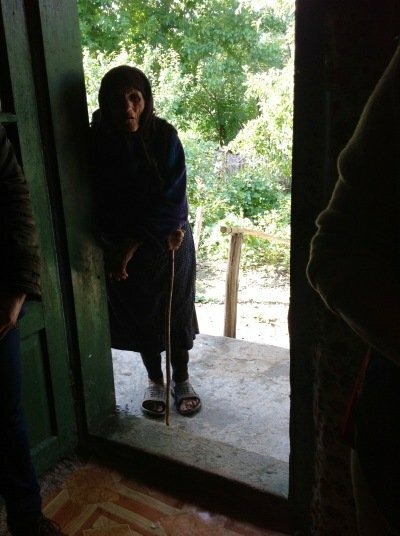 In rural areas, the lack of running water or heating makes life arduous for the patients and their carers. Overall, Relief Fund investments in Romania since 1991 have provided long-lasting change and benefit to thousands which would never have happened had the organization not been created and had Edward Parry not visited the aftermath of the Siret river flooding. The wider impact through those whom FSC have trained is numerically incalculable but is surely significant. (EP note: Mention should also be made of Jessica Hellings, our then admin coordinator, whose connections with the Bacau-based Missionaries of Charity was also instrumental in helping us focus our efforts on the area). I travelled to Romania by train with Elizabeth Winstanley. Six days travelling and five days viewing projects and interviewing beneficiaries, partners, staff and three mayors in rural communities. We met with Ken Hawker and Marta (RFFR charity shop Managers) at King’s Cross station for a coffee who told us they thought that RFFR shop staff would be very interested in some news and feedback on our visit. A meeting in Bucharest with Ozana Ilie of the Budimex Hospital Project. I did not visit the hospital as I had a bad cough and cold and was unable to meet Dana Condrea as she was out of town. This review is a pragmatic “see, ask, listen and tell” report incorporating the aims and objectives outlined. There is a short section on SWOT lines overall but I did not attempt a formal SWOT analysis of all projects. It is not within the scope of this report to give an in-depth analysis of the socio-economic and political background in Romania which is well-known to the RFFR and covered in detail in the quarterly reports that FSC send to the RFFR.. These are the impressions I gained of significant issues over the course of 5 days. Tokenism: On my first morning I noticed some smart new recycling bins had replaced the filthy old brick rubbish dump outside Gabi’s Bacau flat. I looked in the glass and plastic containers expecting that in the Romanian tradition of mild anarchy they would be full of any old rubbish but was impressed to find them tidily full of the correct stuff. When I remarked on this to Gabi she said “Sure, the sad thing is they mix it all together when they collect them!” I encountered many instances of this nod to standards that were basically ignored, not I hasten to add, at FSC. in FSC projects. The Ministry of Works has granted ALL of FSC’s Care of the Elderly budget costs for 2014 for wages and some other costs. Usually they make various cuts. Notably FSC are the only organization in Romania to have all of their request granted. services and funding”. “The EU is just not interested. Romania tells them they are dealing with health and social issues and the EU believes them because all they care about is the economy and the enforcement of stringent controls”. Rural poverty The plight of the rural poor, especially the elderly remains dire. Pensions can be as low as £25 - £50 per month, hospital doctors tend to over-prescribe expensive medicines; more and more younger relatives who could have helped have gone elsewhere or abroad to work. There is still no running water in any of the villages and no local shops, even if they had money to spend. I honestly wondered what on earth some of the elderly poor were eating there being little or no evidence of food in the house. This has always been a problem and it remains so. FSC with the NGO Forum lobbied the Minister of Works in Bucharest about Law 34 i.e. to grant them funding for Care of the Elderly as essential services, not to keep them waiting for months on end for news of funding and for the funds. He was sacked a week later. But in light of recent news, perhaps it worked as full Law 34 funding was granted to FSC. In 2008 the main office was moved to a new location in a poor part of town at Str.Marasti 32. It is known as the Mosaic Centre (please see Mosaic report for full details) and comprises offices, meeting facilities, the Mosaic crafts workshop and a “Glue Club” for local school children. The office in str.Livezilor is still open and used as a centre for the volunteers and for much needed storage. The “Founder” of FSC is Mrs Doina Rosu (mother of a former Romanian GP with FSC). This is an honorary title, required by law in the founding documents, but with no active role in the running of the organization. The Board is mainly involved in fundraising and major decisions such as capital expenditure, the buying of property etc. They meet 2 – 3 times a year, sometimes more often. They are not very “hands on” but fulfill legal obligations, read all reports and make useful contacts, sell tables for the annual Gala etc. Florin Finaru helps out with training, the volunteer programme and making introductions for FSC. Gabriela Achihai signs legal documents. Irina Avoricitei (Director FSC) deputises for Gabi Achihai as necessary. Changes to the Board came about after an audit by BESO which was critical of too many FSC staff on the Board. (British Executive Services Overseas (BESO) carried out an external review of FSC in April 2005). Lenuta Nastac resigned and Dr Stefan Cobanu, very sadly, was killed in a road traffic accident. The current Board comprises a good mix with a broader experience and contacts in the fields of local commerce and industry. Elena Ungureanu: Care of the Elderly rural areas, Supervisor of all programmes, and supervises registrations, certificates and legal approvals. Middle management staff are very much engaged in strategic planning, problem-solving and forward planning. All coordinators and top management are trained in project management, strategic planning, fundraising, proposal writing, training of other people and financial management, They perform many other tasks apart from the day to day direct management of activities. All FSC employees are legal, have working contracts which are registered in a national database. For those on low salaries FSC try to give Christmas bonuses. FSC calculate their annual core costs as 136,494 GBP/year (representing core team plus expenses). Because of state funding, FSC’s accounts are checked monthly by various state departments. Once a year FSC publish their accounts in the National Monitory Register. This is obligatory for “public utility organisations”. According to the yearly budgets and cash flow projection, each programme has a budget to cover the basic costs and other special projects (according to the funding lines approved by individual funders). After expenses are made by the authorized people (coordinators) they are registered (and numbered) on-line into a document posted under FSC’s Google account. This is passworded and reflects the expense made/by whom/on what, etc. This helps to keep the cash-flow under control. According to the requirements of the many different funders, the financial department prepares financial reports for donors which are approved by The President. 1. Income from RFFR 1997 – 2012 represented 21% of total income over this period. !n 1997 of course this was 100%, slowly diminishing and would be higher overall without capital expenditure from Norway, Colin Williams etc. With the exception of the Mozaic Centre and Dr Stefan Ciobanu Elderly Day Centre, both in Bacau, all of FSC’s work is heavily dependent on the use of vehicles. Much of the work takes place in scattered, outlying rural villages in Bacau county and beyond. Even in the Bacau projects, vehicles are used daily in the supply of provisions and for staff and beneficiary transport. In addition, FSC donated 4 minibuses (Norwegian grants) to local rural communities, the mayor pays for the driver and the petrol. This has developed the mayor’s “man with a caruta” facility which still exists in some communities. (A caruta is a tradiotional Romanian horse and cart). FSC manage and oversee this activity and that of the local Social Workers (employed by the mayors) in the rural Care of the Elderly projects. All of the vehicles were donated to FSC in various grants. Several of the vehicles have well over 100,000Km on the clock. Wear and tear over country, untarred roads and tracks is heavy. At present, FSC do not foresee having enough capital reserves to replace any of these vehicles. EU grant opportunities have now all passed to government agencies. A lot of expertise is invested in the most senior staff but this is now less so than some years ago. Income generation: artwork sold is labour intensive but inexpensive and small. Complex systems are very labour intensive. If future funds dry up FSC may face accounting staff cuts. Management systems appeared to me improved since the BESO audit and entirely satisfactory. The Board is not very active. I think this is not necessarily improvable and that sometimes reality has to be faced. British Executive Services Overseas (BESO) carried out an external review of FSC in April 2005. Improve performance and management system at Board level. “The Board should undertake a scrutiny role” etc (p.19 BESO report) The Board see all of FSC’s reports and do take an overseeing role My own view is that management and performance at FSC is consistently satisfactory and results in little need for Board intervention. Be more rigorous in commercial activities and in charging for services Achieved: training, Care of the Elderly and Milly residents all now charged on a means tested basis.There will remain an ongoing need to look at opportunities to charge for services but this will always be limited in caring for the poorest of the poor. I went through all of these systems in detail with FSC.I am satisfied that they have addressed these issues and they have many systems of measuring Key Performance Indicators, project analyses, beneficiary and staff feedback. On examining some performance indicators with FSC, staff performance was rated as 100%. I queried this as impossible and was told by a senior member of staff “ It is actually nearer 125% as we work week-ends unpaid, provide our own food for the children etc”However, FSC agreed to review their appraisal scoring. FSC senior staff and I went through the whole of BESO’s 2005 report and I was satisfied that all of their recommendations had been addressed. But, I am not from a specialist management background and am sure some small issues may have been overlooked or not fully understood by me. If FSC ever have the funds for a further management audit, this may be worth considering. It is true that FSC Board are not that “hands on” or active, but they are very busy in their own careers and bring a good mix of experience to their role. As mentioned in the SWOT analysis, I do not think this is improvable or that it would be worth risking stability by further change. Review hours, distances walked and general conditions for care workers. Can anything be done to improve their pressure of work related to time available? A very successful project with well motivated staff but is future funding secure? Could FSC again lobby for state funding from the mayors’ budgets to provide staff salaries? Adapted from the original Mobile Health Centre 1992 onwards which developed to support local Romanian doctors and nurses and provided a Mobile Pharmacy 2004 – 2009, family planning etc. Most communas now have their own doctors and pharmacies as a result of RFFR and FSC’s past actitivites. The project trained local Community Workers who are now employed by rural mayors and now co-ordinate the Care of the Elderly teams. They acted as partners for local mayors in various EU grants e.g. for the Glue Clubs buildings. Check disabled access at the Huruiesti Dispensary (RFFR funded). Access was very poor up many steps. Letter written to the Mayor by Edward Parry. The Mosaic Centre houses FSC offices, a Glue Club and the Mosaic Workshop. The Mosaic project is part of the fund-raising, income generation and PR departments of FSC. They make and sell artwork, cards and handicrafts. In 2012 they raised 23,702 Euros most sales being at Easter, Mothers’ Day and Christmas. They promote merchandise with a catalogue, monthly newsletter to 3,000 and an online shop. They use project beneficiaries to make some items which is a good inclusivity tool. Operating since 2004 this prize-winning programme has at the time of reporting 280 well-trained and supervised volunteers serving 3,723 beneficiaries in 31,326 hours of work for the year. They help in all projects, particularly the summer camp. Please see full report for details. Vali Racila and Dr Necula at Gasteni have been seminal agents for change in the field of adults with disability in Romania alongside many years of specialist input from Mary Turner, Muzika, Impart and others. They have been pioneers in helping to change attitudes towards and opportunities for adults with physical and mental disability. Vali now works as a peripatetic Arts Teacher in three institutions and a centre for blind children in Bacau. Vali has been funded by RFFR for many years. He remains something of a loose canon which contributes to his success in manipulating rigid state systems. The current set-up, workshops, theatre etc at Gasteni is fantastic and a far cry from the days when naked residents were hosed down with cold water. Make more use of Adrian Tabol who needs a new computer. He is desperate to be of more help. I have a testimonial/request from Adrian (Appendix iv) He could perhaps edit Gasteni video clips for uploading onto RFFR website? Over the years, RFFR have run many programmes at the Budimex, Co-ordinated by Dana Condrea. (As outlined in the project report). Ozana Ilie has worked for RFFR for 10 years as a paediatric psychologist specializing in the support of children suffering from terminal illness and/or surgery – and their families.. Ozana originally started with RFFR as a Play Therapist but has developed this role as the playrooms disappeared owing to pressure on bed numbers. On asking if the hospital could fund her role and more like it, I was told an emphatic “no” but could this nevertheless be pursued? Operational 1998 – 2008. FSC now focus on early intervention in the Glue Clubs, scholarships and community support programmes. One presumes this is a good thing! I found to the best of my abilities, that BESO’s recommendations had been implemented. One of my fist questions at the briefing meeting with FSC was “What is the state doing to train and provide health and social services outside hospital (which is known as secondary care). The answer “ NOTHING”. Gabi Achihai would be willing to lobby at European level about the lack of state provision for primary health and social services but she would need advice, help and support. That “somebody” urgently considers a vehicle appeal. I have approached my brother about this with no success but if Gabi were to do so, she may have more luck. Gabi wondered about having a “Romanian Corner” in the RFFR shops whereby FSC could send some handicraft articles, pictures etc. Finally, thank you so much to Edward and the RFFR Board for enabling this visit. I am only sorry that a very difficult year has led to such delayed reporting. 2007: Awarded for best Volunteers Project by national People for People Gala of AmCham (American Chamber of Commerce) and ARC. My name is Adrian Tabol and I was born in 1961 in a little village called Vladomira, comuna Trifesti in Iasi County. When I was 2 years old, I was diagnosed with a severe illness. 7 years later my parents thought I would receive better care in a specialized institution in Siret, Suceava County. Time passed and after a while, I came here. Throughout the years, I have dreamt of owning a computer but this was never possible due to financial aspects. Fortunately, with the help of Doamna Julia, Mrs. Julia from England, I received my first computer. 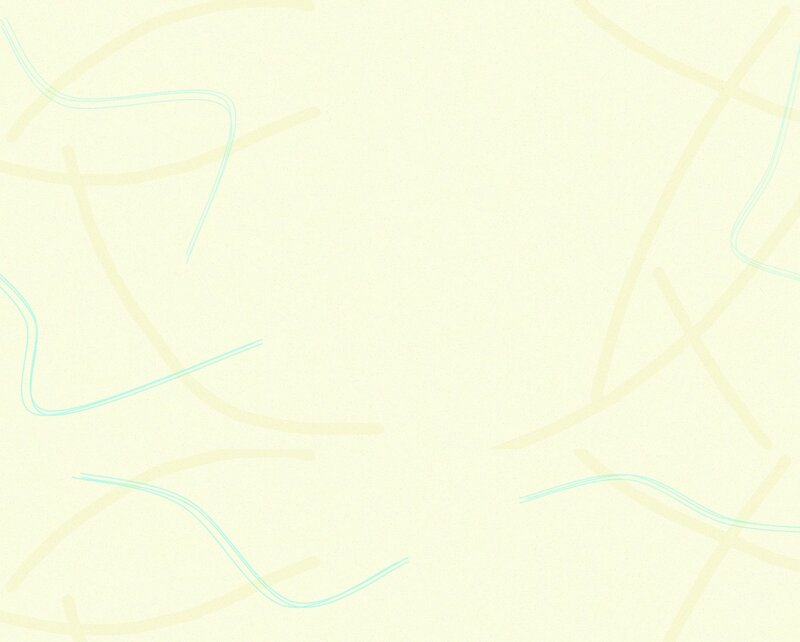 In the beginning, I would draw in Paint and play video games. Vali Racila’s arrival at our center was a blessing for us all, especially for me. He took the time and patience to teach me more advanced skills on the computer and we started with text editing in Word. I used to take care of the texts they needed at Gasteni Theatre. Things started taking off after that and I started video editing thanks to Domnul Edward Parry’s help, who very kindly gave me a new computer. After installing his Pinnacle video capture card on my new computer, Vali would give me video tapes of Gasteni Theatre performances and I would cut and peace together everything into proper DVDs. Meanwhile I started writing articles for a periodical called Impreuna, which I still do. I also work with photographs. Radio responsibilities came along with my technical knowledge and experience and every morning I go to the radio studio here at the center and I prepare the morning’s playlist. After this, I start editing the recordings of the theatre’s shows. I truly believe I have come a long way and because I am so passionate about video editing, I would call myself a professional.